Tamiya are often referred to by vintage R/C model collectors as being the “masters of marketing” among hobby brands. They weren’t the first company to release R/C cars (not by a long shot), and they probably weren’t even the first to invent an electric R/C car. But they were certainly the first to popularize electric R/C cars from about the mid-1970s onward. And a lot of their success was achieved through clever marketing, as much as producing a high quality product. 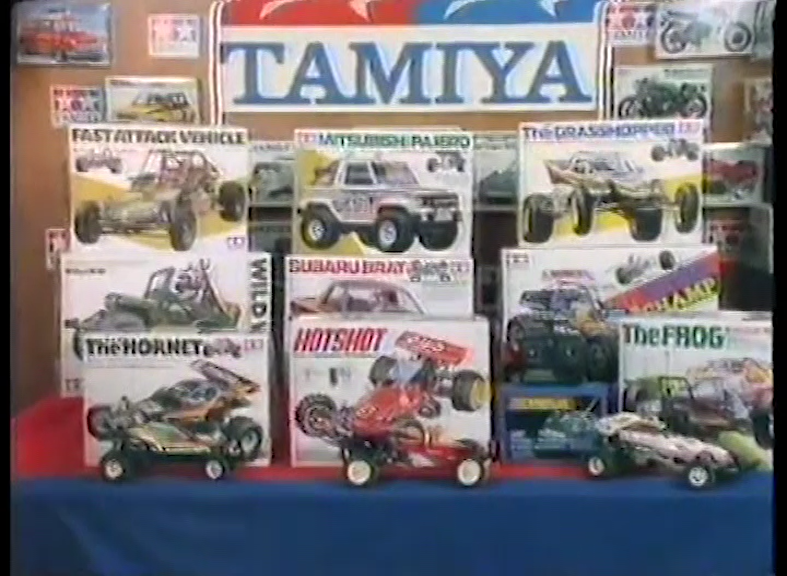 As well as widespread parts support, extensive print advertising, and glossy catalogues to promote their products, Tamiya promotional videos could also be seen in many hobby shops back in the 1980s – usually running on repeat from a VHS tape, on a TV set. 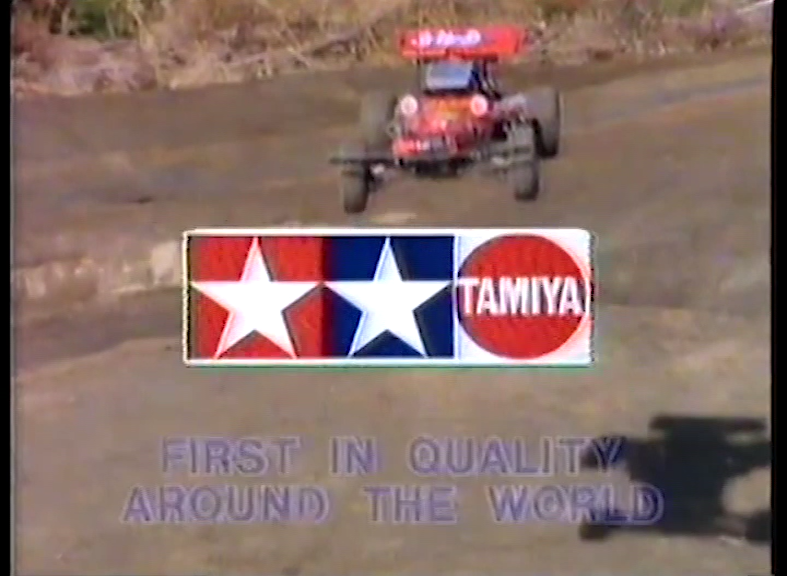 But it’s no surprise that Tamiya also had the marketing clout to advertise directly on TV in various countries. As I was just a little kid growing up in Australia in the 1980s, I wasn’t exactly aware of anything that was happening with the Tamiya brand. All I knew was whatever I heard in the school playground, where kids would talk as often about R/C cars as they did other popular toys – like Transformers, Lego, Star Wars or Micro Machines. My mates would regularly boast about which cars were better or faster than others, and so on, and some kids would even have the odd magazine with pictures to pore over. So I had a general idea of what many of the popular cars looked like, and how cool they were. If I had seen an actual Tamiya TV commercial back in the mid 1980s, I’d probably remember it to this day – as these expensive R/C toys were things you heard about much more often than actually saw in the flesh. If you owned one, or had a friend who owned one, you were doing very well. So I’d probably have somersaulted in excitement just from seeing a Tamiya TV commercial. Nevertheless, TV commercials did exist it seems. And the following are a fun 60 seconds – particularly if you’re an Aussie. It’s only 30 seconds. But let’s face it – if you were 10 years old and saw this on TV in 1985, you’d have been ready to donate a limb to own one of these cars. Featured here are the Hotshot, Hornet and Frog – three models that could not have been more eclectic and unique compared to one another. Such was Tamiya’s beautiful range of individual and interesting (and realistic) buggies at the time. Another 30 second commercial aired in 1987, this time featuring The Fox along with The Hornet (still going strong), Striker and the Monster Beetle. If I come across any more Australian ads from the 1980s, I’ll be sure to share them. 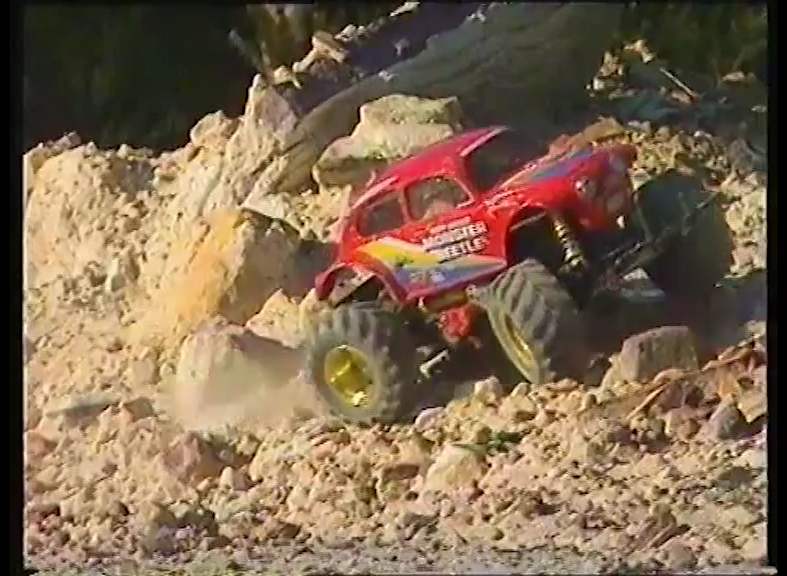 Here’s another Tamiya commercial that aired on Australian TV, but a few years later – around 1994. 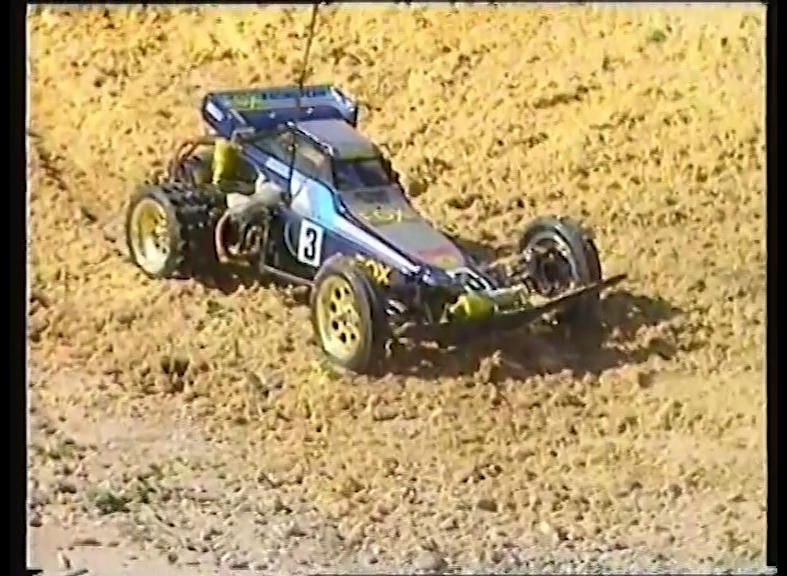 The off-road buggy boom was well past it’s peak by the 1990s, and this is around the last time that I can remember seeing any sort of Tamiya commercial on TV. But I do recall that they ran this one a fair few times, usually during daytime TV. It featured the very popular Super Hornet, which went on to be one of Tamiya’s best sellers. Along with arguably the last Tamiya buggy to really emphasize the “animal” metaphor clearly (where a car was named after and looked like an animal) – the Manta Ray. I might as well add this clip here as well for it’s sheer Australian-ness, and for those who haven’t yet seen it. By some miracle, someone had kept it on VHS and uploaded it to Youtube. In the 70s and 80s, there was a children’s afternoon TV show in Australia called Wonder World! that was hosted by Simon Townsend. It was a sort of “infotainment” show for kids. At some point in 1985 it seems they ran this segment featuring R/C cars, giving a quick-look into this exciting new hobby, complete with plenty of leering and goofing around. Tamiya was the popular brand of the time, but you’ll also see an Associated RC10. Tags: 1985, 1987, Simon Townsend, Tamiya, Tamiya Fox, Tamiya Frog, Tamiya Hornet, Tamiya Hotshot, Tamiya Monster Beetle, Tamiya Striker, TV Commercials, Wonder World! Wow, I definitely don’t remember those ads, but did manage to see the usual promos at my local country toy shop as a 10yo. So cool to be able to watch them these days! Youtube is a wonderful thing Dave. 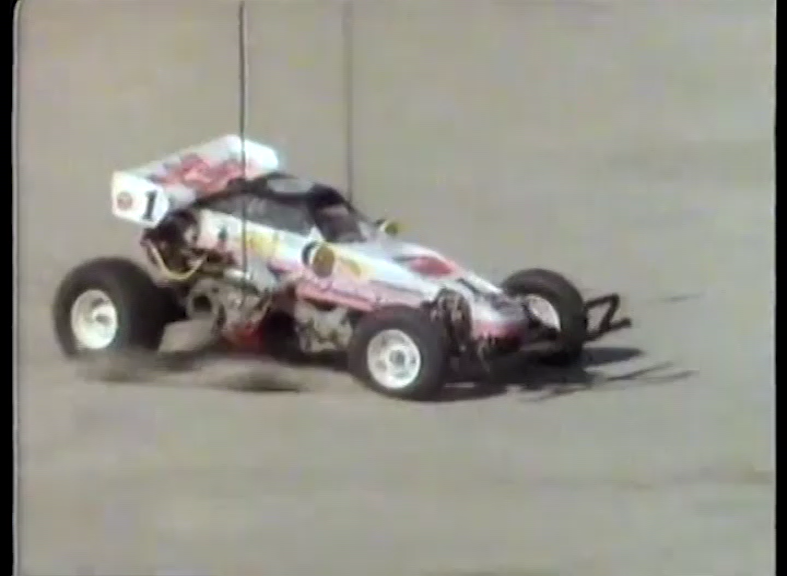 Don’t miss the extra clip I added a little later, of an R/C segment on Simon Townsend’s Wonder World, circa 1985. It seemed fitting to include it here under the theme of Aussie Tamiya coverage in the 80s. IF only it were that easy to pick up cute blond girls back in MY day running my HotShot around. I can dream right?? LOL I would also love to get one of the Tamiiya flags I saw in the video, seems here in the USA that we had little in the way of promotion or promotional items associated with Tamiya, at least in my local hobby shops. I remember another Wonder World segment that featured the Super Shot, think it’d won Toy of the Year or something. And maybe another brief mention of The Frog when in a toy shop. On a side note, you can find clips of Wonder World presenter Edith Bliss doing pop songs hehe..
It’ll be great if we can track these down eventually Dave, and you just never know what old VHS recordings people will dump on Youtube in the future.